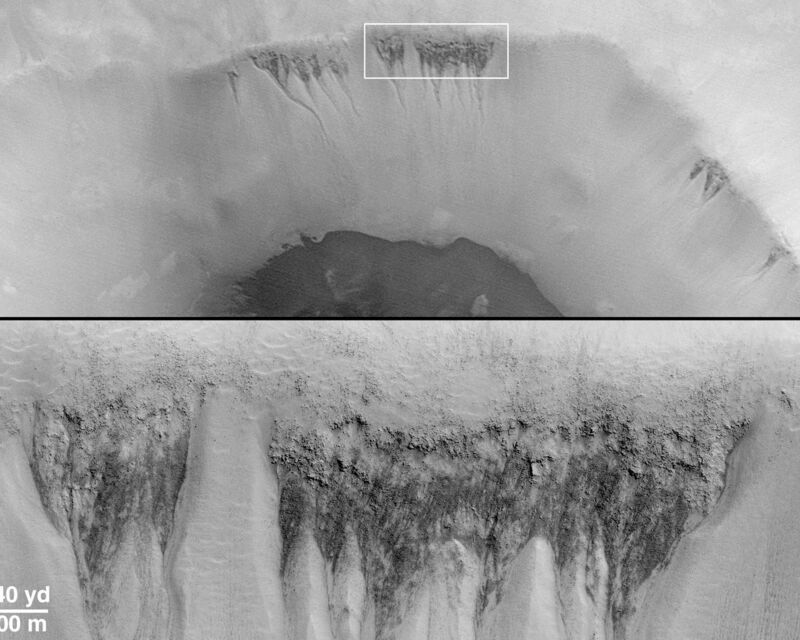 The first clue that there might be places on Mars where liquid groundwater seeps out onto the surface came from a picture taken by the Mars Global Surveyor (MGS) Mars Orbiter Camera (MOC) during the pre-mapping Orbit Insertion Phase of the mission. The picture, shown in (A) above, was taken at the end of December 1997 while the spacecraft was still in the midst of aerobraking maneuvers to put it into the circular orbit needed for the Mapping Phase of the project. The Aerobraking 1 image, AB1-07707, showed dark, v-shaped scars on the western wall of a 50 kilometer-(31 mile)-diameter impact crater in southern Noachis Terra at 65°S, 15°W (see B, above, for context). The v-shaped features taper downslope to form narrow, somewhat curved channels. 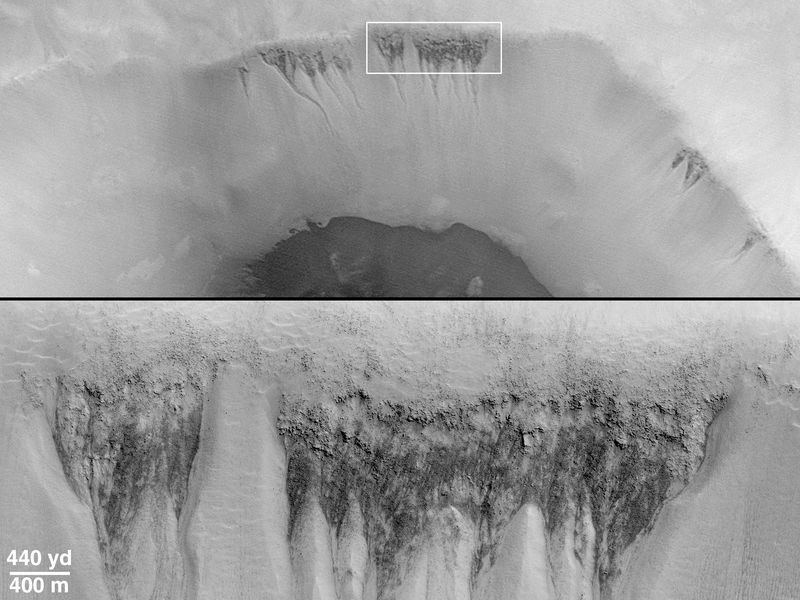 The relationship seen here was interpreted by MOC scientists to be similar to seepage landforms on Earth that form where springs emerge on a slope and water runs downhill. Once MGS achieved its Mapping Orbit in March 1999, the MOC was in a better position to take pictures of 10 times higher resolution than the Aerobraking AB1-07707 image. The opportunity to take a new picture of the proposed "seepage" sites on the wall of the crater in southern Noachis finally arose in January 2000. The result is MOC image M11-00530, shown above in (top) and (C). This new close-up shows that the darkly-shaped scars host many small channels of only a few meters (yards) across. These small channels run downslope and coalesce at the apex (or point) of each "v." Amid the small channels are many large boulders, some of them the size of houses, that have eroded out of the crater wall. A 3-D view created using the AB1 and M11 images is shown in (D). The stereo picture (red-blue "3D" glasses required) emphasizes the presence of small channels and valleys, and shows that these valleys start almost at the very top of the v-shaped dark areas. The context picture in (B) is a mosaic of Viking 2 orbiter images 497B47 and 497B48 acquired December 28, 1977. The Aerobraking MGS MOC image, AB1-07707, is shown overlain on the Viking context image; it was taken 20 years later on December 29, 1997. The smaller white box in the context picture shows the location of MOC Mapping Phase image M11-00530, roughly 2 years later on January 4, 2000. North is "up" in pictures (A) and (B), and to the lower right in (top), (C), and (D). Sunlight illuminates (A) from the upper left, (B) from the upper right, and (top) and (C) from the upper right. 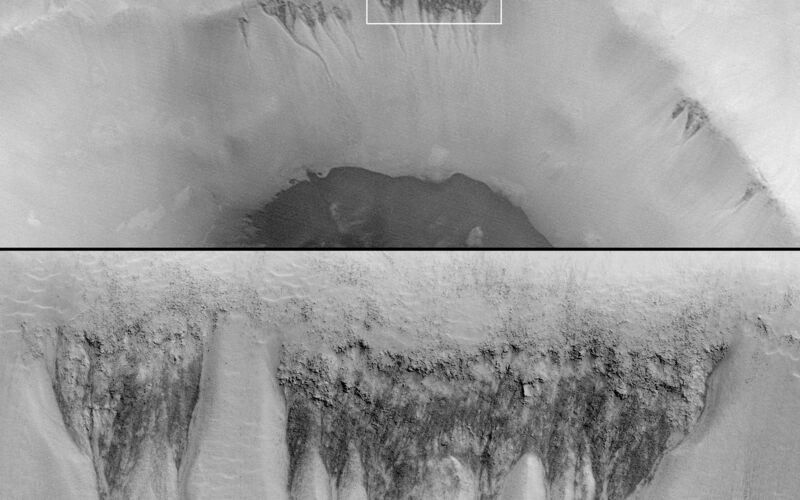 The top image in (top) is the aerobraking image, AB1-07707, with a white box indicating the location of the lower image, M11-00530, and the stereo pair in (D). The white box on the left in (C) shows the location of the close-up on the right in (C).